specializes in digital audio interface and signal processing products for the recording, mastering, broadcast, and post-production markets. Our interface products are comprised of a variety of sample rate converters to fit different needs and budgets and several digital audio routers, switchers, distribution amplifiers, and format converters. These products are designed to simplify digital audio integration in facilities with many different digital sources and destinations which may require different interfaces and/or sample rates such as DAT machines, A/D and D/A converters, digital audio workstations, CD players and recorders, digital consoles, and outboard processors, to name but a few. 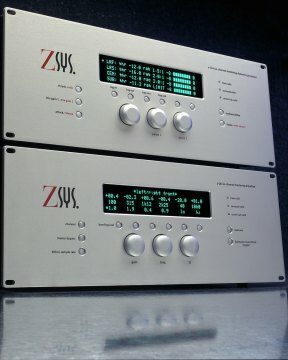 Z-Systems also manufactures signal processing equipment for professional mastering. Our range of signal processing equipment includes both two-channel and six-channel gear for equalization and dynamics processing. Our processors are based on proprietary, cutting-edge digital signal processing algorithms and feature 24-bit resolution at up to 96 kHz sampling rates. These processors are suitable for no-compromise stereo and surround digital mastering and deliver unprecedented sonic quality at affordable prices. Z Systems Audio Engineering. 1325 NW 53rd Ave, Suite B Gainesville, FL 32653. P(352) 371-0990, F(352) 371-0093, z-sys@z-sys.com.